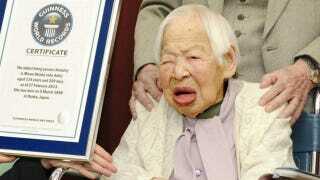 Yesterday, Guinness World Records recognized 114-year-old Japanese woman Misao Ookawa as the world's oldest living woman with a certificate, seen here. Then Reuters, either unfazed by or unaware of the superstitious implications, did the unthinkable and called the award an "early birthday present," before going on to declare that "next week, Ookawa will rack up one more year of living on March 5 as she turns 115." "Given everything, it's pretty good," she said upon receiving the certificate.